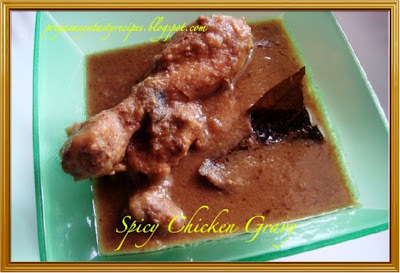 I tried out different sort of gravies with chicken, but our favourite is always this tomato based chicken gravy..This gravy was our sunday's special lunch.I prepared Ghee rice n spicy chicken gravy together, they both goes awesome together, nothing will beat the taste of this gravy..i follow somewat my mom's method of preparing this delicious gravy with slight changes according to my taste buds..she used to use redchilly powder, but i used dry red chillies grounded with handful of wonderful spices n fresh tomatoes...This delicious chicken gravy goes fabulously with parathas, rotis also with south Indian breakfasts..when we were kids, my mom used to make 100%mutton r chicken sunday, she used to prepare the breakfast, lunch n dinner with chicken r with mutton as sunday specials, i still remember that we used to wait since early morning to have the chicken r mutton stuffed idlies, my all time favourite and Briyanis for afternoon..the list goes long, just missing all those wonderful days..My H loves any dishes with chicken and this spicy chicken gravy was one of his most favourite gravy, so am dedicating this yummy gravy to him, this gravy goes to FIL-Tomato by Sanghi's Food Delights n also to Think Spice -Think Pepper guest hosted by Divya of Dil Se, event by Sunitha.. Grind all the ingredients from the list 'TO GRIND' as fine paste with enough water n keep aside, wash thoroughly the chicken pieces with turmeric powder n keep aside.. Heat now oil in a kadai n add the bay leaves, fry it until they turns brown..add immediately the chopped onion pieces n ginger garlic paste n stir fry until the raw smell goes away, add the washed chicken pieces, slit opened green chillies n salt, stir continously until the chicken pieces changes their colour..
Add the already grounded paste now to the kadai n stir for few minutes..add water as per ur need, cook until the oil gets separates, add the chopped coriander n mint leaves n put off the stove..
My Mom used to prepare once a week this delicious gravy with okra n tomatoes (pureed) with gingelly oil , this gravy will ressembles quite like Peppercorns n Cuminseed gravy well know as Milagu Jeerage Kuzhambu..This gravy stays for a week n they will tastes divine after a day..after few more days, no need to say how they will taste, usually we finish this gravy with three days as we love this delicious tangy gravy like anything..this kuzhambu tastes too good with hot steaming rice n papads, for non vegetarian people boiled eggs goes prefect for this gravy r simply with an omelette,i dedicate this delicious tomato gravy with okra to my brother, who is die hard fan of this delicious gravy. Heat the gingelly oil in a kadai, add the mustard seeds, fenugreek seeds, uraddal n let them splutters..add the whole shallots,curry leaves, garlic cloves n stir fry until the shallots turns transculent, add the okra pieces n stir for few minutes, add the tamarind juice, pureed tomatoes with pepper powder, cumin seed powder, coriander powder, red chill powder with enough salt.. bring the gravy to boil n cook until the oil gets separated..put off the stove.. Serve hot with rice n papads!! Luknowi Koftas!! potato spinach balls served with rich creamy gravy..i crossed this recipe while googling n got hooked with this kofta curry.. i went through the recipe which seems quite a long, anyhow i want to make these koftas for sterday dinner, the ingredients list seems really very long, but the preparation took really very less time than an hour..These delicious koftas with rich creamy gravy tastes divine n everyone at home loved the lucknowi kofta curry much..i didnt stop having the fried koftas as they tasted soo delicious..They suits prefectly with Parathas...This is my 2nd entry to RCI-Lucknow guest hosted by Lavi of Home Cook's Recipes, event started by Lakshmi ..
For Koftas: Mix all the ingredients of koftas together and divide into equal portions and shape into balls deep-fry till golden in colour. Drain the excess of oil in an absorbent paper and keep aside. For Gravy: Heat the oil in a pan , fry the chopped onions until they turns golden brown, add the grounded ingrediens n stir fry for few minutes.. add now the turmeric powder, coriander powder, sugar n salt again stir fry for few seconds. Add now the tomato puree n cook everything on high heat, stir continously until the oil begins to separate..
Now add the yoghurt, milk and cream n stir continously till the oil begins to separate, add a cup of water n bring to boil, simmer for 5 to 10 minutes until the gravy turns as desire. Just before eating, place the fried koftas in a serving dish and pour the hot gravy over and serve immediately garnished with garam masala powder and chopped coriander. Heat the oil in a large pan, stir fry on hight flame all the veggies except the spring onions along with gigner n garlic with little salt.. Once the veggies turns slightly tender, add the cooked rice, shredded chicken, black pepper powder, white pepper powder, soya sauce, chilli sauce, spring onions and mix well to combine.. Cook for 3 to 4 minutes n put off the stove..
Drizzle few drops of oil in a small pan, break the egg n pour it directly to the hot oil, springle pepper powder n salt, cook on both sides until they turn golden brown r completely cooked..
One more Korean dish i tried last week for a trial and finally loved this pancakes..its really quite easy to prepare but grating potatoes in a ginger grater needs two hands else its also another easiest dish from Korean cuisine...Normally pancakes r prepared with flours but this korean pancakes need just potato paste with spring onion n carrots, this savoury pancakes are simply delicious if u have them as hot pancakes..We had this pancakes with hot chilli sauce n ketchup which suits prefectly as their side dish..This goes to AWED-Korean guest hosted by PJ of Seduce your Taste Buds, event by DK of Culinary Bazaar.. 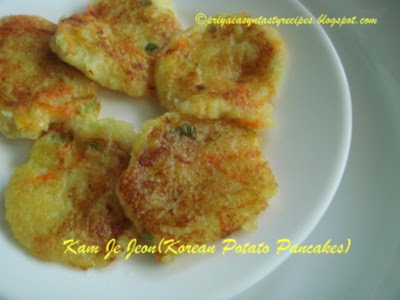 Using a ginger grater, grate the potatoes as fine paste, meanwhile grind the onion in a mixer n extract the juice from the onion, add this juice immediately to the potatp paste , also add the chopped green onions, grated carrot pieces , salt and mix everything well..
Heat a pan n makes small pancakes n drizzle few drops of oil..cook until they turn brown on both sides, starts serving immediately, coz this pancakes tastes delicious if u serve them hot.. Enjoy with hot chilli sauce! NOTE : Rush in your entries to FIC-Rose/Pink and MEC-Savoury Snacks. Entries sent and acknowledged by mail are only considered. Click on the logo FIC-Pink/Rose and MEC-Savoury Snacks in the side bar..
One more deep fried snacks i bookmarked n tried from Mahima' s blog...I love pakodas, once i saw this palak pakodas in her blog, i started really craving for these pakodas...But i was out of stock of fresh spinach leaves instead of fresh spinach leaves i used finely chopped frozen spinach leaves, as i was having a packet of frozen finely chopped spinach... Also i used green chilly pieces instead of chilly powder n skipped the coriander powder else i followed everything as Mahima prepared her pakodas...Thanks Mahima again for sharing this crispy snacks..u may see her Palak Onion Pakodas here..This is my entry for MBP-Snacks & Savouries guest hosted by Ashwini's Spicy Cuisine, event by Coffee..
thawed spinach, asafoetida powder, kasuri methi, curry leaves,salt.. add the hot oil n turn everything as thick paste, i didnt used water coz of thawed spinach leaves..
Take a handful of the thick paste n drop gently in the oil n fry until they turns golden brown..fry them in small batches..drain the excess of oil with a paper towel.. Enjoy ur pakodas with hot coffee!! 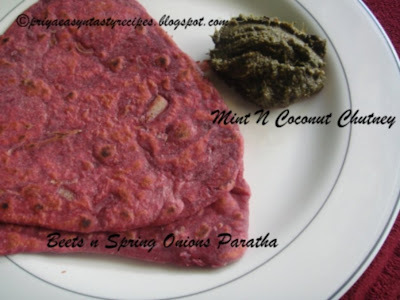 Colourful Paratha with beetroot n spring onions with a tsp of ajwain seeds n garam masala, needless to say that these pink parathas are healthy as well as they stay very good even after a day, if u conserve them properly. These parathas are very much prefect while we go for travelling for a long journey, as ajwain seeds are in this parathas they helps for good digestion also gives a superb flavour to the parathas, as a side dish for this parathas, i will surely recommand to try the mint n coconut chutney (thuvaiyal) which also stays prefectly for more than two days in room temperature and for several weeks in fridge, this chutney tastes divine with beets parathas, U may think that coconut will spoil the chutney after a day, even i thought the same but my friend D confirmed that this chutney will stays for more than two days..i surely confirm now yea they stays good coz of tamarind,ginger, garlic which we are using to prepare this chutney...This mint n coconut chutney suits prefectly with any sort of rice dishes, my H relished this chutney with hot steaming idlies...This both dishes goes to Meals on Wheels by LG of Taste of Mysore n also to FIC -Pink/Rose guest hosted by me n event started by Sunshinemom of Tongue Ticklers..
Heat a tsp of oil n fry the ginger pieces, garlic cloves n tamarind pieces until brown, keep aside...now put the mint leaves, coriander leaves n curry leaves in the same kadai and fry until they shrinks, take off the shrinked leaves n add the coconut pieces n dry roast for few minutes, take all the roasted ingredients in a mixer r blender add enough salt n springle few drops of water... grind them as bit coarse paste..
Heat 2tbsp of oil n add the mustard seeds n urad dal, let them splutters n add the grounded paste to the oil n turn for a while until the oil gets separated.. Healthy Paratha with delicious chutney!! Sieve both whole wheat flour, all purpose flour with baking powder and baking soda in a large bowl, add the rolled oats, salt to the sieved flours n keep aside...Preheat the over for 350F..beat sugar, butter n canola oil until they turns soft n fluffy..add half of the butter milk,dark chocolate powder n beat everything for a while, slowly add the flours and now add the remaining butter milk , beat everything until they turns soft..
Pour the batter in a greased loaf pan, arrange the pan in the middle rack of the oven n bake for 35-40 minutes r until the skewer inserted come out clean...let the bread cool for atleast 10 minutes n slice them as per ur need..
Am also sending this chocolate breakfast bread to For the Love Of Chocolate event by Poornima of Tasty Treats.. Whenever i go to Indian grocery, i used to pick a bottle of rose syrup..i love rosemilk since i was kid and i do rosemilk very often coz my H love much...he used to have rosemilk with ice cubes even its midnite, he loves that much...few days back it was to sunny n i want to prepare some drinks, but finally i ended up with lassi with rose syrup..quite an easy drink ready within few seconds.. 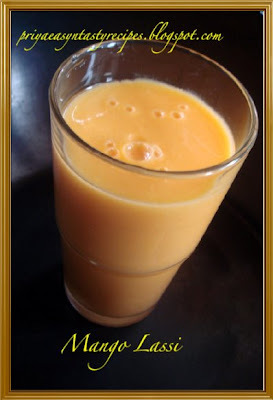 Blend yoghurt, chilled milk, rose syrup, water n honey together in a blender for few seconds... serve them immediately with ice cubes..
Varsha of Will O' the Wisp honoured me by sharing this Excellent Blog Award..Am so honoured, thanks a ton Varsha..
Anisheetu passed me Lovely blog award, Triple award, Great Buddy Award, Friends Award, Amazing Blog Award and The Adorable Blog Award..Thanks a ton Anisheetu for sharing all these wonderful awards with me..Am touched n very happy!! Wash bean sprouts and cook in water with some salt until soften. mix all the ingredients for sauce with a fork until they get well mixed.. Put bean sprouts on top of rice and serve with the prepared sauce!! Most of the kids love noodles n pastas, hope everyone might have crossed rarely kids saying that they wont like pastas r noodles..i have seen my cousin's kids started having pastas once they crossed their first anniversary, even my sister in law used to add pasta in her kid's soups just to finish their soups..Pasta are quite a complete meal for kids with these sorts of creamy sauce...I love to prepare pastas often coz pastas are prepared with wheat flour n the sauce which i prepare always to the have with pastas are mostly prepared with low fat cream which are rich in calcium and i used toss always the sauce with veggies, quite a simple way to feed kids with the veggies if they dont like to have as stir fry etc..So u can guess easily that i will surely have always a packet of pasta in my pantry n these pastas are really handy to feed easily anyone within few minutes...Our's yesterday lunch was Pasta with creamy tomato sauce n broccoli with french fries..i simply prepared this creamy tomato sauce with tomato pulp, low fat cream n flat parsley leaves with broccoli..This is my entry for Pasta Party by Jyoti of Panch Pakwan..
Cook the spaghetti as per package instructions, drain and toss it in some oil.. Heat the olive oil n add the chopped onion, minced cloves together until the onions turns transculent..add the tomato pulp, chopped parsley leaves, pepper powder with enough salt n bring them to boil, add the broccoli florets n add immediately the low fat cream, again bring everything to boil... meanwhile make a thick white sauce with cornflour n water n keep aside..add this white sauce to the boiling sauce n cook until the sauce get thickens..
Add the sauce to the pasta n toss gently till they get nicely coated with the sauce...Serve hot!! 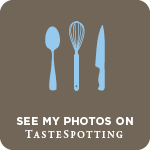 On the way to Tasty Bites For Toddlers event by PJ of Seduce Your Tastebuds!! Its has been quite a week i didnt post my bakes..here comes one more healthy scones from my oven, i tried out without egg n replaced the egg with buttermilk, after googling n searching through net i found this eggless oatmeal scone recipe..I want to bake something as quick bread also nutritious, so i went through the recipe i changed few ingredients the original recipe said..These scones are very much prefect for breakfast also very healthy..
Take a baking tray n place a baking sheet springle the flour , now place the dough n roll with rolling pan, brush the dough with buttermilk n cut the dough as wedges..bake them for 20-25minutes until they turn brown.. Remove the skin of the tapioca until the white layer appears.. cook them well with salt (as per taste) r a pinch of salt in a pressure cooker, smash them nicely with ur finger or grate them..Add sugar, grated coconut and the cardamom powder. Take a small quantity of smashed tapioca and make them as small balls, roll these balls over the dessicated coconut evenly n serve them..
Soak the urad dal for an hour before grinding, grind first the whole green gram for few minutes add immediatey the urad dal, (dont add water at all) grind both urad dal n whole green gram bit coarsely,add the salt to the dals,this help the dals to grind together well, now add the chopped onion, chopped green chillies, chopped ginger pieces, chopped curry leaves, crushed peppercorns, fennel seed powder(i have added the salt while grinding)..mix everything well with ur fingers..
Heat oil for deepfrying, take a small ball from the medhu vada batter n flatten them with ur fingers, drop gently one by one to the medium hot oil..deep fry the vadas until they turn brown, fry everything as small batches, drain the excess of oil with a paper towel.. Serve hot with spicy chutney!! Lucknow!! wish i could visit this place while my next visit to India.. i certainly fallen in love with Lucknowi cuisine when i went for searching delicious dishes for RCI-Lucknow guest hosted by Lavi of Home Cook's Recipe's, event started by Lakshmi...Lucknow is the captial of Uttar Pradesh..Nawabs of Lucknows are well known for their slow cooking ( dum style) may be my next cooking venture might be a dum style rice dish who knows,I crossed this kesari kheer while browsing through a link Lavi have listed in her post..once i start reading the ingredients, immediately i want to try them..This Kesari Kheer needs just simple ingredients n they tastes delicious..This kheer is definitely gone to be a keeper for us..
Wash and soak rice in 1/2 cup of water for 1 hour. Cook the rice in the same water until the rice is fully cooked, add milk to the cooked rice. when the milk starts boiling, simmer and leave the kheer to cook till the milk starts thickening, stirring occassionally. Mash the rice a liitle, add sugar and condensed milk.Add almond pieces, pistachios pieces and saffron. Boil the mixture one more time. Remove from flame, add cardamom powder and nutmeg powder. Serve chilled r hot as per ur preference!! Grind the sugar n cardamom together in a blender into fine powder..dry roast the rava in pan until the aroma comes out..take the roasted rava, powdered sugar n cardamom in a mixing bowl..meanwhile heat a tsp of ghee n roast the cashew nut pieces until they turns brown, heat the remaining ghee in the same pan in simmer, add the roasted cashews to the mixing bowl..add little by little the hot ghee n mix with a spatula...make small balls out the mixture.. Delicious Rava Laddoos !! conserve them air tightened box..
You may ask urself wat is basque country rite? ?Basque country is a region in the western Pyrenees that spans the border between France and Spain, on the Atlantic coast. This Poulet basquaise,the famous basque country chicken dish is such an aromatic dish, they are usually prepared with bouquet garni (dry thymn leaves tied with bay leaves) i tried it out with parsley leaves..
Heat a tsp of oil n fry the chicken pieces until they turn slightly brown, meanwhile heat the remaining olive oil in a large vessel, add the chopped onion, tomato pieces, crushed garlic cloves n saute until the onions turns transculent, add the chopped parsley leaves n tomato pulp to the vessel, cook everything for a while, finally add the red n green bell pepper pieces saute them for few minutes..add the chicken broth, pepper powder, salt n keep the flame in simmer, let the gravy cooks for 5 minutes, add the already fried chicken pieces to the gravy..let them together for 20minutes in low flame.. Serve hot with Basmati rice!! Green beans, sometimes known as string beans, snap beans or French beans..the green bean offers less protein and more fiber and other nutrients.Green beans are an excellent source of manganese, and vitamins K and C. They are very good source of dietary fiber, potassium, iron, folate, and vitamin A. They are a good source of calcium, protein, magnesium, riboflavin, thiamin, niacin, and copper. As these green frenchbeans are very good source of vitamin K, which play an important role in bone healthy and prevention of osteoporosis,increase in consumption of vitamin K rich foods such as green beans have been shown to improve bone health..As our younger generations need to be very strong, its very much recommanded to give twice a week these green beans..i prepared this steam cooked french beans and served with baked chicken crisps for sterday lunch, this chicken crisps need a tsp of oil n they are baked in oven..these both dishes are quite healthy n delicious..kids will love for the sure...This is first entry and this tasty dishes goes to Kids Lunches guest hosted by Srivalli of Cooking 4all Seasons, event started by Meeta K..
Heat olive oil in a pressure cooker, add the chopped onion n crushed garlic cloves, stir fry them until the onion pieces turns transculent, add the trimmed french beans n saute with salt for a while in simmer (until the beans turns tender), springle some water, add the pepper powder n toss gently..close the pressure cooker with lid , cook it for 10 minutes without putting the weight...put off the stove n put the weight..keep aside..
Marinate the chicken pieces with pepper powder, cumin seed powder, red chilly powder with enough salt n half a tsp of oil..let them sit in fridge for an hour..Preheat the oven to 350F,make a thick paste with corn flour n water..dip the marinated chicken pieces in the corn paste n roll them evenly in bread crumbs..place a baking sheet over a baking tray, brush the baking sheet with oil n arrange one by one the breadcrumbed chicken pieces n bake them for 15-20minutes until they turns golden brown in colour..
Once the steam get released, serve this delicious steam cooked french beans with oven baked chicken crisps!! Serve hot with any choice of chutneys r else can have them alone!!! Simple tomato sandwich prepared with toasted bread n beets mayo sauce, wrapped in a aluminium foil suits awesome for picnic..beets mayo sauce plays as a spread for this easy sandwich which need just few tomato pieces, if u want to make the sandwich with cucumber, grated carrots, this beets mayo sauce goes prefectly as sandwich spread...check out how i prepared the beets mayo sauce here, this sauce need just few easy ingredients u can find out very easily also available quite in our kitchen, easy to prepare too...Coming to sandwich, just toast ur bread slices with electric toaster or with few drops of oil in a pan, both works out prefect. Spread the beets mayo sauce over the toasted bread slices n arrange the chopped lengthwise tomato pieces..cover the tomato pieces with another bread slice..serve as sandwich.. Beets mayo sauce will make this sandwich more tasty n healthy!! Serve these bread cutlets with ketchep!!! 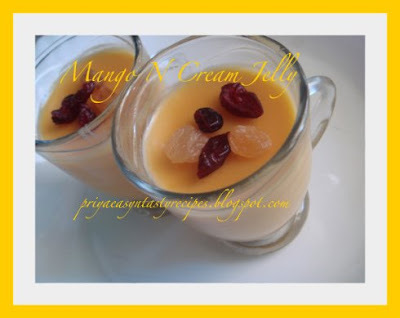 On the way to Sunday Snacks-Grab & Go by Pallavi of All Thingz Yummy! Heat enough oil in a kadai, add the mustard seeds, urad dal, cumin seeds, dry red chillies n asafoetida powder and let them splutters, add the chopped onion,slit opened green chillies, fresh tomato puree n stir everything for a while, now add the capsicum pieces n saute with salt for a while, add the cooked toor dal n add enough water, bring everything to boil..put the flame in simmer n cook until the capsicum pieces are tender, add the lemon juice n put off the stove..add the chopped coriander leaves to the pappu.. 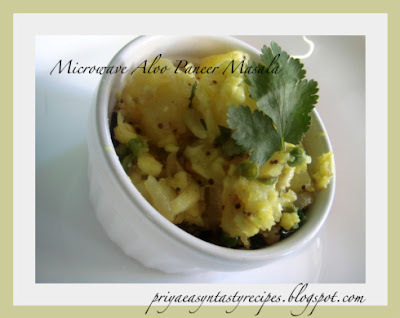 Serve hot with steaming rice topped with ghee!! Beets Mayo Sauce- Sauce or Dip??? Once i starts cooking, nowadays my mind is just going around and searching about pink dishes...hehe..no am not getting mad, its just the passion of cooking its seems haha!! This beets mayo sauce is also one among my pink dish, every saturday we go for farmer's market to get fresh vegetables, this time i got beets for a reasonable price, so i bought almost one kg..This time i immediately steam cooked my beets n conserved them in fridge( they stays prefect for a week)..today for my sandwiches, i need to prepare something as sauce, finally i finished preparing my sauce for sandwiches with beets, mayonnaise, parsley n cream cheese...we loved the beets mayo sauce n we relished almost the whole bowl...even we had this pink sauce simply with grilled breads..
Few days back i bought a pack of paneer from Indian grocery, as they were laying for atleast one weekin my fridge, i want to do something with paneer n tomatoes as a delicious lunch..i dont want to prepare something which need a long cooking process..Paneer, my daughter's all time favourite also she loved fried rice very much,initally i thought of making tomato pulao but last minute i changed my mind n prepared this tomato n paneer fried rice coz this rice dish need few minutes, also my daughter will surely happy to have this paneer n tomato fried rice also its really very easy to prepare, i used canned tomatoes for this recipe instead of fresh tomatoes which gives a lovely colour to the dish...finally i added paneer cubes to this make this tomato fried rice more delicious, also i served this tomato paneer fried rice with broccoli masal vadai, Yea!!!!! 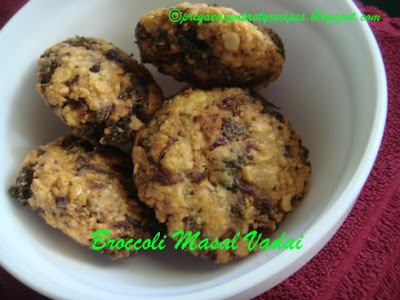 masal vadai with broccoli, i tried it out friends..they tastes too good, if u have anyone at home who doesnt like broccolis, its quite a easiest way to feed them with this antioxydant rich vegetable...i prepared the broccoli masal vadais as we do with our usual masal vadais,yes i prepared them with soaked n grounded channadal.. While cooking the basmati rice add few drops of oil, this helps to keep the rice grains not to stick..Heat enough oil in a large pan, add the bay leaves, cloves n cinnamon sticks n fry them until they turns brown, saute now the onion pieces, tomato puree with soya sauce,garam masala powder,salt, pepper powder n red chilly powder n stir everything continously until the oil get separates, add immediately the paneer cubes n toss gently for a while...add the already cooked basmati rice , chopped coriander leaves n mix gently everything until they get well mixed.. Serve hot with Tomato n Paneer Fried Rice, an excellent pair!!! I tried this tomato bread soup for sterday dinner from Suganya's Tasty Palettes, she shared a worthy soup with left over bread cubes, as i had a packet of left over breads, this soup seems to be prefect for me after a long tough day,also tomato soups are always my hsband' favourite one, i want to prepare something with tomatoes n went through suganya's blog, finally i got hooked with this tomato bread soup, which seems completely new to me and also quite easy to prepare... Its such a tasty soup with tomatoes, everyone at home loved this combination much, also this soup is completely nourishing one..ur leftover bread turns as a delicious soup with tomatoes, is there anything better than this comfort food? ?..Thanks suganya for sharing this amazing delicious soup, which is definitely a keeper for us..
Heat the oil n saute the onion pieces, minced garlic n pepper powder until soft, add the tomato pieces , salt n cook until they turns mushy, put off the stove n add the coriander leaves n blend everything with a blender..now add 2 cups of water to the blended veggies n bring to boil, add the cubed bread pieces n cook until they get soaked with the juices, add more water if needed...cook for a while..
Add the remaining milk and stir everything well.. 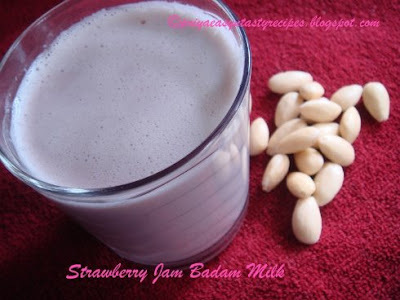 Serve them as luke warm badam milk!!! 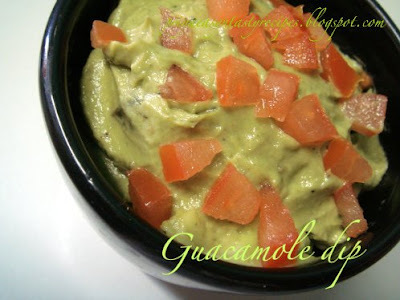 Guacamole is an avocado-based dip, famous Mexican dip...Ripe avocados, onions, lime, and salt are common to most recipes. Lime or lemon juice is added for flavor, and to slow the enzyme causing browning.Other common ingredients include minced tomatoes, black pepper, chili pepper, garlic, cumin, and cilantro. Adding coconut milk or regular milk smooths the guacamole texture.Traditional Mexican ingredients include avocados, minced tomatoes and white onions, fresh coriander, lime, garlic, salt and pepper.I prepared this guacamole as vegan coz the recipe i went through for guacamole was made with a teaspoon of cream, which i omitted for this vegan version..This is my entry for Vegan - Mexican by Vaishali of Holy Cow.. 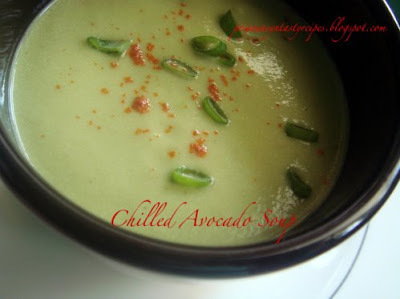 In a small bowl, mash avocado with a fork or potato masher to make a slightly chunky mixture. Stir in onion, tomato pieces, minced garlic, chopped coriander leaves, lemon juice, pepper powder and salt. 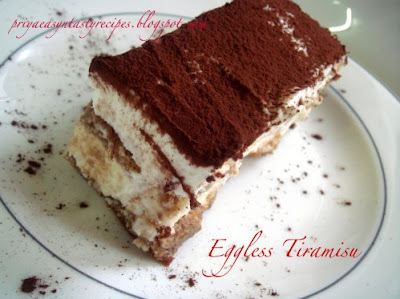 Serve with tortilla chips, we enjoyed with grilled french baguette slices!!! 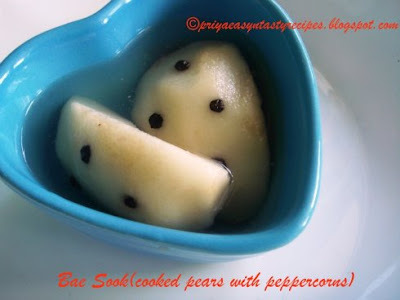 Cooked asian pears with peppercorns, seems quite different na?? even i thought how they tastes,i really want to give a trial to this easy n different dessert from Korea coz i never had korean foods till i tried this dessert, which pulled me to give a try to this korean dessert also..I found this dessert recipe here, u may see this dessert recipe under dessert label...as i recently bought asian pears in chinese store,i immediately got hooked to this dessert.. Asian pears are crispy n juicy fruit, they remains unchanged after picking or storage..There are three types of Asian pear: round or flat fruit with green to yellow skin; round or flat fruit with bronze-colored skin and a light bronze-russet; and pear-shaped fruit with green or russet skin. U can find this asian pears very easily in chinese stores...These asian pears contain about 16 percent carbohydrate and negligible amounts of fat and protein. They are good sources of the B-complex vitamins and also contain vitamin C; in addition, they contain small amounts of phosphorus and iodine. This simple dessert goes to AWED-Korean guest hosted by PJ of Seduce Your Tastebuds, event started by DK of Culinary Bazaar..The original recipe need 4 cups of water n pinenuts, i skipped the pine nuts n reduced the cups of water coz of my asian pears as they were slightly ripened..As i used peppercorns, its goes to Think Spice- Think Peppers guest hosted by Divya of Dilse, Event started by Sunita ..
Peel and core the pears, cut them as quarters n round the edges of the pears, keep aside...Now combine the water, sugar n pears in a pan n bring them to boil..put in simmer and cook for 5 minutes..let them cool in fridge.. Serve them in a small bowl with 2 r 3 pears... Enjoy this delicious slightly spicy pears!!! A calzone (in Italian "stocking" or "trouser" or "drooping sack" or "hanging fold"), sometimes referred to as an italian sac, is an Italian turnover made from pizza dough and stuffed with cheese (usually mozzarella cheese and Ricotta, but some varieties contain Parmesan, Provolone, or a locally substituted cheese), ham or salami, vegetables, or a variety of other stuffings. It often contains an egg, the yolk of which should be runny. It is typically served with marinara sauce on the side for dipping, or topped with garlic and parsley infused olive oil. The dough is folded over, sealed on one edge, salted, then fried.Sandwich-sized calzone are often sold at Italian lunch counters or by street vendors because they are easy to eat while standing or walking. I prepared calzone with our indian style stuffed with spiced potato n green peas masala with grated cheese n used store bought pizza dough..its really quite easy n delicious lunch with salad also prefect for dinner with simple soup...Kids will love this cheesy indian style Calzone..this cheesy italian sac goes to Cooking For Kids-Potato guest hosted by Deepa Hari of Simple Home Cooking, event started by Sharmi..
Heat oil, add the chopped onion with fennel seed powder, saute until they turns transculent..now add the potato pieces, green peas with garam masala powder, red chilly powder with enough salt ,stir everything fo a while n springle some water, cook in simmer with lid closed..once the oil get separated, add the chopped coriander leaves n put off the stove..keep aside n let them cool..
Preheat the over to 350F..Place the potato-green peas masala to half of the dough, springle the grated cheese over the masala, fold the another half over the masala n give a press to the pizza dough with fingers r with fork..brush the unbaked calzone with few drops of oil..Bake the calzone for 20 minutes.. 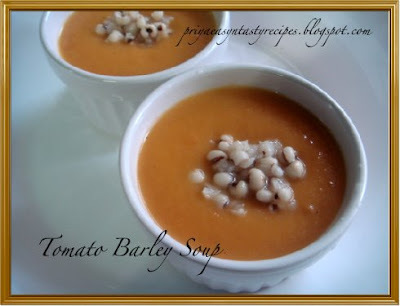 Serve hot with salad r soup!!! 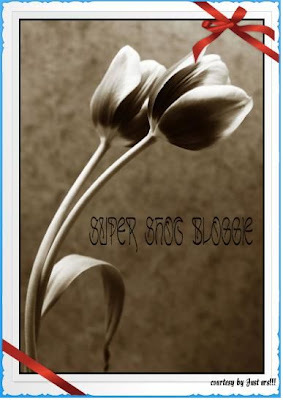 All these clicks goes to Magnificient Click Contest event by Gayathri of Just Urs!!!! Madhuram of Eggless Cooking surprised me by sending a cookbook for sending so many eggless entries for her Egg replacement event, an awesome n unique event...Thanks a lot Madhuram, i received today morning and am very glad to get a cookbook for bakes, u made my day Madhu...u know wat, i never ever bought a cookbook till today, u have send me a fabulous gift as cookbook, i will surely cherish this book much Madhu...once i received this cookbook, i immediately went through the cook book n learned more n much about baking...i prepared this apricot and orange muffins from this cookbook, i skipped the egg n replaced with vinegar n baking soda..This is my last n fifth entry for Egg Substitute -Vinegar by Madhuram,also to Sunday Snacks-Grab & Go by Pallavi of All thingz Yummy..
Preheat the oven to 350F..Combine the apricots, orange zest and juice in a small saucepan n cook over in medium heat until just get warm, sift the flours with baking powder n baking soda in a large bowl, make a well in the centre....add the honey, butter, vinegar together in a bowl and stir well, pour this mixture into te well n add the apricot-orange mixtre, milk and stir quickly until they get mixed, dont overmix..the batter should be slightly lumpy..
Spoon the muffin batter in a greased muffins mould r a silicon mould, bake for 20-25minutes until they turns golden r a skewer instead into the centre comes out clean.. 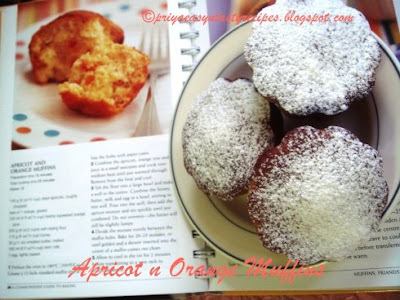 Delicious Apricot n Orange muffins!! 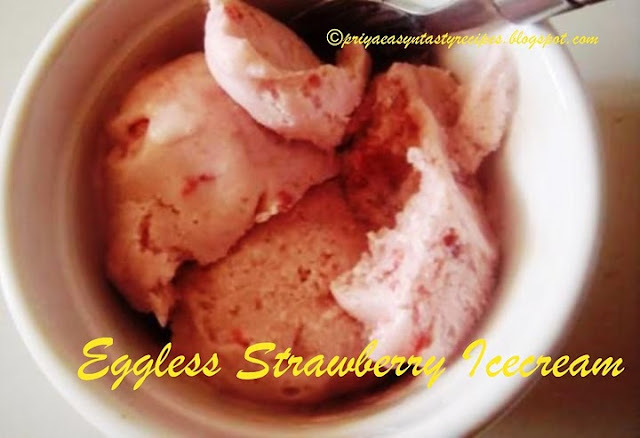 Eggless Strawberry Icecream..made with fresh strawberries, its one of my favourite flavours in icecream...heard about this recipe from my friend, i started making in home itself and was very much surprised of the result, it was excellent, tasty n colourful. I was very happy, coz i used to say that ice creams wont come out well without a icemaker,after making this icecream without a ice maker i changed my opinion about this...quite easy to prepare home itself...just with three ingredients i never thought that icecream might be that much easy to prepare at home..usually while making icecreams without ice makers, we have to turn out the freezed icecream to avoid the crystal formations, but in this icecream, once u freeze u dont need to worry about it, coz this icecream doesnt need heating, boiling etc... can do this tasty icecream with kids while summer vacation, as its very easy to prepare. 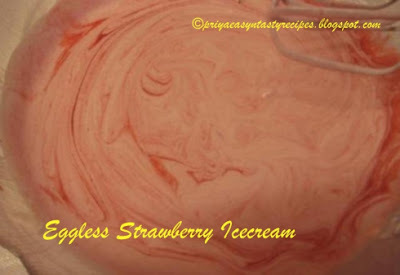 Keep the fresh cream for half an hour in freezer before starts making icecream, this will helps the cream to double their volume easily..grind few strawberries into fine paste, this is fresh strawberry pulp.. Beat the fresh cream with electric beater until they double their volume..add the condensed milk to the double cream n beat for a while until they turns soft n fluffy...Now add the fresh strawberry pulp with the beaten mix..beat again until the pulps mix together very well..add the rougly chopped strawberry pieces to the mix n freeze them overnite r atleast for 6 hours in either stainless steel box r in a simple plastic box..
Homemade Eggless Strawberry Icecream is ready to serve n relish!! !